This has been an interesting teacher's appreciation week this year. First, I was bitter. 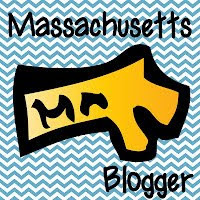 Here in Massachusetts, it's MCAS time again, and my fourth graders were scheduled to have their tests during Teacher Appreciation Week. I whined to my husband, "So all those catered lunches they've planned for us? Mr. E. and I will get there after everyone else and we'll be scraping together whatever's left." Oh boo hoo, right? Then I got sick and I had to call out on Monday morning. Again, I was mad. "I'm missing all the good stuff they had planned for me!!" I rested, had lots of tea and juice, but felt worse instead of better. That afternoon I dropped off the MCAS review materials I spent all weekend creating because I was pretty sure I'd have to be out Tuesday too and I was not about to have all that work go to waste. By Tuesday night, I was no longer whining about missing catered lunches. I'd had zero appetite since Saturday night anyway, and now their MCAS test was tomorrow. Do I go in with a fever of 101.7? Do I...miss the MCAS? I couldn't imagine this. Sure, Mrs. L. missed it last year, but she gave birth the day before so it was acceptable. I asked some of my teacher friends in the blogging world what I should do, and although they all said, "stay home," I didn't want to. One even admitted that the year she had to be out, many of her kids blew it off and finished in 20 minutes. Math was a HUGE focus this year in our district, for our grade. We worked so hard this year to raise our math scores after the hit they took when we adopted a new program last year. I was in tears the night before when I decided I had to make that phone call. 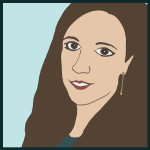 I wasn't able to stay awake very much this past week, but while I was awake, I was on the teacher's forums and blogs. And I wasn't the only one having a difficult week. I read stories about teachers whose principals forgot it was this week, who laid people off this week, and whose PTOs actively decided to do nothing for the teachers this week. It made me realize that although it felt unfair that it had to be MCAS week, and then it felt unfair that I couldn't be there to receive it, at least I was actually appreciated! And even more special was the fact that some of these teachers enduring a lack of appreciation were spreading the joy that it wouldn't seem that they'd have. They were showing their appreciation for OTHER teachers! 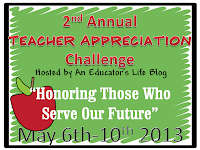 Calling them up and thanking them for making them better teachers. It really changed my perspective. I was being pretty shallow up there in paragraph 2. And at this point, I couldn't care less about getting trinkets. I just wanted to get back to school and check in with my class and help them feel a sense of normalcy before their second session on Friday. After seeing the doctor on Wednesday and getting a handful of prescriptions, she told me to stay home at least until Friday. And although most of my symptoms are in check and my fever's gone, I am still bone tired (which might be the medications, not the virus). So I continued to rest up. Still worrying about how it went yesterday, how my principal (or parents, or anyone) perceives my 4 day absence during MCAS, and how the kids are going to react tomorrow when I get there and basically have to say, "Sure I missed you all, but right now let's take this test." Then around 7 p.m. I got a phone call. Mrs. K. is the reading specialist at my school. When I was a first year teacher there, we had common planning time built into our schedule, and I knew right away that she was the nicest lady I would ever meet. Just last week one of my students felt safe going to her to talk about a "girl issue" that I would have been embarrassed to even talk to my mom about at that age. Mrs. K. always tells me that I'm an amazing teacher. She told my mom that when I introduced them at a school event. I asked her to read a passage at my wedding because she's always been an inspiration to me. Mrs. K. was just calling this evening to ask if I needed anything. I told her I was finally on the mend now, but thank you so much. She said she was worried because I've never been out this long. Then she told me that the kids were fine yesterday; she proctored the MCAS for them. I nearly cried with relief. I had no idea my principal had moved people around. Mrs. K. reassured me she's proctored before; she could practically recite the directions from memory. She talked to the kids before the test, gave them a little time to relax before it and then they got right to work. And they worked hard. She told me if I needed to be out again tomorrow don't worry, she'd proctor that session too so to take care of myself. I didn't think I was ever going to find out for sure what happened on Wednesday (well, maybe in October when we got the results). It was such an amazing surprise to find out that it had been Mrs. K. in charge on MCAS day! And the fact that she didn't even wait until I got back to put my mind at ease was amazing. I work with an amazing group of teachers, but Mrs. K. is the most inspiring person I know because she is the most giving person I know. And she will definitely be getting her favorite treat (blueberry muffin) from Duncan Donuts tomorrow. 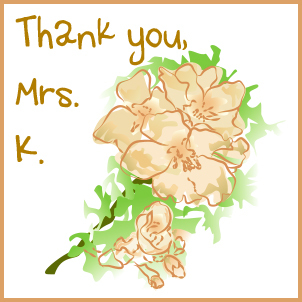 Happy Teacher's Appreciation Week, Mrs. K!